Breakfast begins with a quiet click as Chef Liu’s neon open sign fizzes to life above the restaurant’s glass door. While it seems to be another international restaurant lost within the beige strips of Buford Highway, Chef Liu’s has held its ground for a decade now — and rightfully so. I was impressed right from the start as food arrived swiftly. The servers adhered to custom by first bringing tea. Then came the sweet soy milk and youtiao, a lightly salted Chinese churro of sorts that, dipped in soy milk, is a Chinese breakfast staple. 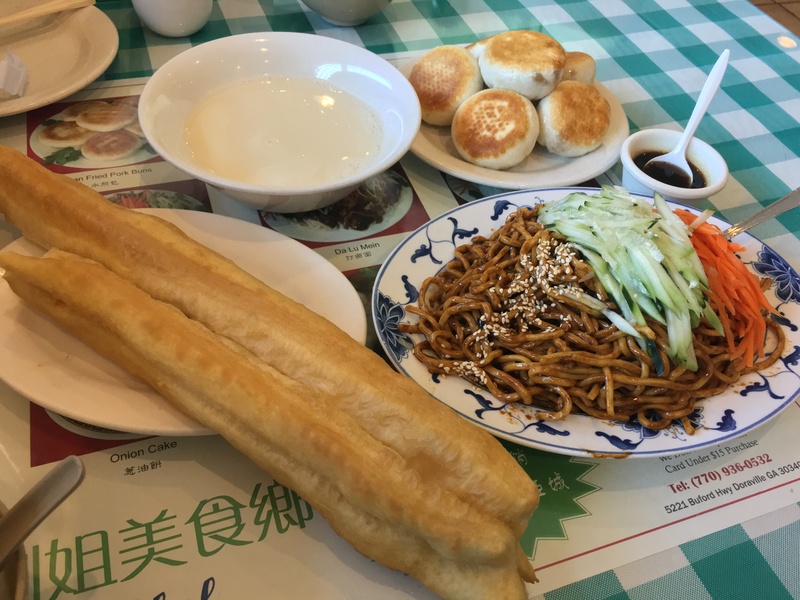 Though a simple dish, it can be hard to find good soy milk and youtiao at many Chinese restaurants. Often times, soy milk is over sweetened, the sugar numbing out the nutty undertones of the soybean, while youtiao can be butchered after being fried so long that it is more crunchy than crisp. Chef Liu’s manages to get it right, with the soy milk harboring a delicate sweetness and the youtiao crispy yet soft and airy on the inside. Since it was nearing 10 a.m., an acceptable brunch time, I also ordered the cold spicy noodles and pork buns. As a cold noodle enthusiast, I have accepted that many restaurants simply do not have the patience to cool their noodles. Thus, I was delighted when the noodles did that part of their name justice. Unfortunately, the noodles fell through on spice level, barely tingling my tongue every few bites. Nonetheless, the noodles were delicious; the soy sauce evenly blended in the noodles, making them neither dry nor droopy. Chef Liu’s pork buns convinced me that I would have to return. As with the soy milk and youtiao, pork buns can be difficult to get right. One must not only concoct a juicy inside but work a fluffy dough that can absorb the juice. Chef Liu’s did this wonderfully, serving the buns toasty on the outside and with a small sauce cup of soy sauce and vinegar that added just the right touch of acidity. At last, the meal finished with a red bean bun, large enough to share, though perfectly conquerable on your own. Admittedly, the red bean bun was where the meal fell a bit short. The sauce, while sweet, warm and with great consistency, lacked the texture of whole red beans that a homemade bun would not dare miss. And, although the pork bun achieved that texture, the red bean bun lacked moist dough. Instead, it came across as rather rushed and dry. Nonetheless, Chef Liu’s served a liberal amount of red bean sauce, something not all restaurants are willing to do. The meals are meant to be shared. Portions are generous — one order of the soymilk and youtiao is enough to serve three. All dishes are set in the center of the table, and there is no music, allowing conversation to be traded effortlessly. Oddly enough, the restaurant was sparse. Past the glass doors, a paint chipped stand offers newspapers to a small waiting room, occupied by no more than a gumball machine with yellowing plastic and hoards of flyers tacked to the wall. Don’t let this turn you away — appreciate that there is no wait. For those who grew up eating authentic Chinese food, Chef Liu’s will be reminiscent of home meals, as the restaurant shows little desire to Americanize itself with its use of heavy sauces and an onslaught of deep fried dishes. As for those who may be unfamiliar with authentic Chinese, Chef Liu’s provides an honest and humble meal, as well as a quiet moment to observe culture through food.